Maryland Traditions, part of the Maryland State Arts Council, presented their 12th Annual Maryland Traditions Heritage Awards. The event was held at the Proscenium Theatre at UMBC on December 1. 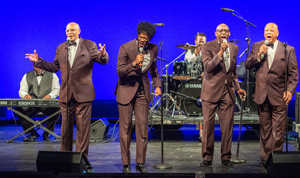 The Sensational Royal Lights, a gospel quartet with roots in Dorchester County performed, and won the award in the person or people category; Curtis’ Coney Island Famous Weiners of Allegany County won in the place category; and stuffed ham, a long-standing St. Mary’s County specialty, won in the tradition category. The event also featured performances by Meki Toalepai Sr. and Jr. of Anne Arundel County, recipients of a 2019 Maryland Traditions Apprenticeship Award for Tahitian drumming, and bluegrass musicians Jay Armsworthy and Woody Norris of St. Mary’s County. Congratulations to all the winners. 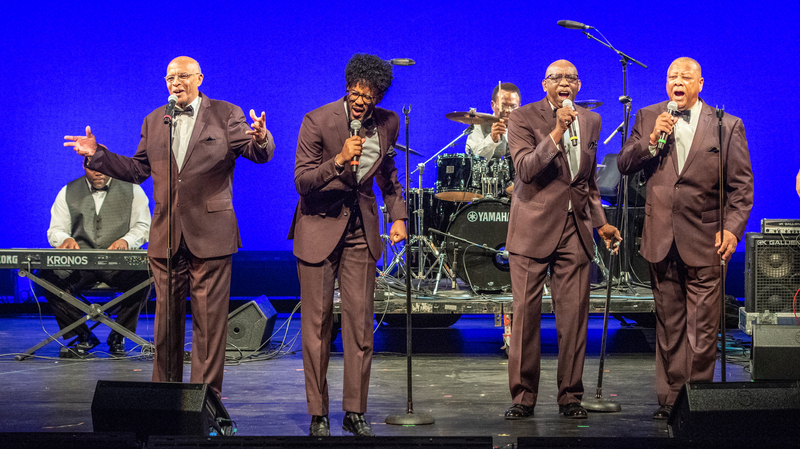 Pictured: Maryland Heritage Award winners The Sensational Royal Lights perform at Saturday's awards ceremony. Photo courtesy of Remsberg Inc.
OTD’s “Home for the Holidays” encourages family and friends visiting over the holiday season to skip the painful stay on the pullout sofa in favor of a hotel stay. The campaign, created by OTD in conjunction with Marriner Marketing Communications, takes a humorous look at some of the struggles of visiting family. To view all the campaign images, or to share on social media, follow this link. 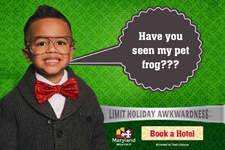 To view the collection of hotel packages available, visit our "Home for the Holidays" pages at VisitMaryland.org here. 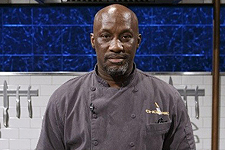 Chef David Thomas, owner and executive chef at Baltimore’s Ida B’s Table, took home the $10,000 first prize on Food Network’s Thanksgiving-themed episode of “Chopped.” "I felt good about what I was presenting based on the ingredients that I had,” said Thomas. “But you know, I was cooking for Martha Stewart. It could have been anybody's game." Ida B’s, in downtown Baltimore, opened in 2017 and features a menu of modern takes on traditional soul food. Thomas’ winning menu included macaroni and cheese, turkey, fried turkey livers, and a dessert. Instagram is launching a wave of API changes intended to protect user privacy, and these changes will have a big impact on how DMOs use the platform. Changes will be introduced over a two-year period beginning December 11, with major takeaways being a restriction on the number of #hashtags that may be queried; requirements for an Instagram business account linked to a Facebook page; username and location metadata no longer provided; and the end of location-based searches. For DMOs using a third-party social media service, contact your provider on the best strategy to proceed, and for DMOs handling their own accounts, make sure to create an Instagram business profile. For a full rundown of planned changes, follow this link. 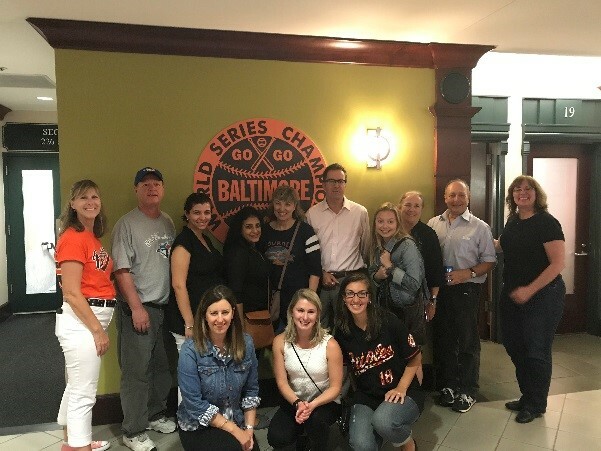 OTD’s PR team hosted a group of Canadian journalists and media professionals for a September FAM tour of Maryland, and the Canadian press is still raving about their trip to the Old Line State. In November, the Toronto Sun published “Maryland is Hip and Historic” by Kevin Hann, a reporter and editor who was on the September tour. 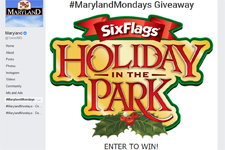 Highlights from Hann’s story include glowing reviews of Oriole Park at Camden Yards, the American Visionary Arts Museum, and other Baltimore landmarks; a journey along Maryland’s Historic National Road scenic byway; stops at Antietam National Battlefield, Hagerstown and Frederick; and glowing praise of Maryland’s impressive food scene. Since running in the Toronto Sun, a paper with a circulation of more than 310,000 readers and a significant online presence, the story has been picked up by Canoe.com and the Vancouver Sun with a print circulation of more than 130,000 and an impressive online footprint. 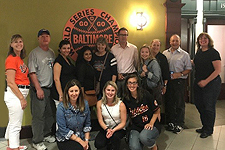 Pictured: OTD staff and Canadian journalists attend an Orioles game in Baltimore during September FAM tour. A Gettysburg Civil War Trails regional meeting was held with Civil War Trails Executive Director Drew Gruber and representatives from local, county and state tourism agencies, Civil War Heritage Areas and historical societies. The group discussed adding sites in Pennsylvania to the Gettysburg Campaign Civil War Trail. Tourism stakeholders from Pennsylvania are in the process of raising funds to add new Civil War Trail waysides to tell stories about the Confederate invasion and retreat and the Federal Army and Cavalry that pursued the Confederates before and after the Battle of Gettysburg. Participants discussed topics including funding and planning considerations for adding new sites, map guide printing and fulfillment, sign maintenance, and marketing.